This item (P6887) is not currently available for purchase. Each of the 9 automatically looping animation sequences is dazzling to behold as multicolor lights animate this outdoor tree. Topped with a lighted star. The light show tree were a great addition to my outdoor decorations. They were super easy to set up. The trees actually arrived a few days early and my daughter set them up in less than 20 minutes. They display awesome in my yard! This is a very nice outdoor decoration. The light show is a wonderful effect. This Lightshow tree is beautiful! I love it ! This light show tree is amazing! It was very relaxing to sit and watch the 9 different phases of the show. We bought it to decorate our yard and received many comments and compliments on it. The only thing that could be improved on this tree is where the wires come into the bottom of the pole - there is a ribber gromet that is meant to protect the wires from the metal...... it doesn't stay in place and so we had to be very careful to not strip/cut the wires when putting it together and taking it apart. I would buy another one in a heart beat and definitely recommend it to everyome. We wil be buying more in different heights for a new idea we have for our yard. We LOVE to watch our lightshow tree. The kids hated taking it down. It was very easy to assemble and store. My only regret is that I should have ordered a taller tree. That's the plan for next year. The light show is great, and it adds so much movement to the yard. This tree was easy to put together. The various patterns in the light show make this more interesting than similar trees. Great addition to any holiday display! The tree was just what I had expected. 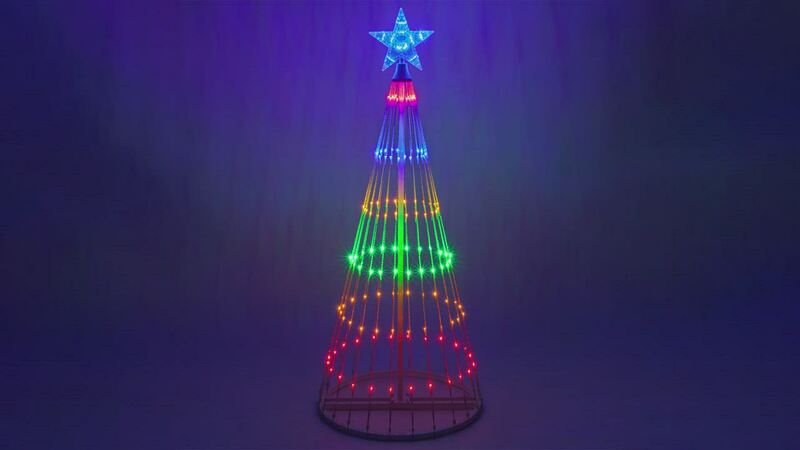 It works great and looks great, but the plastic hooks at the bottom of each string of lights break easy and there seems to be no replacment parts. Very good service, and a very nice product. It is very easy to assemble. It really adds to our Christmas light display. This tree is exactly what I hoped for. It is pleasing to watch it go through all the different patterns of lights. It was so easy to assemble I have it out on the lawn with six spot lights in red and green. Will keep and use for many years to come. We were expecting a little better quality for this price. Had seen them at Home Depot and Menards for less money but thought this one would be a bit better. When we received it and took it out of the box to assemble we noticed that the round base was broken due to poor welding. Then, when we started stringing the lights to the base we found 3 of the light cord hooks that attach it to the base broken. It would be too much of a hassell to re-box it and send it back so we just decided to keep it and find a way to rig the lights to the base somehow. Maybe we just got a lemon but none-the-less we have a defective tree now. This was actually our first outdoor decoration so it was a little disappointing. Sorry for the bad review. Tree was satisfactory. Light shows were not quite what I expected. I have admired these Christmas trees for years and finally bought one. It was easy to set up by one person (me). Because we have wind and big horn sheep and rabbits that eat wires, I set mine up inside my house. It is in my office and I am enjoying it throughout the season. I was a little apprehensive, but this tree looks great. Very brilliant colors. Any video demo you see is under-whelming. I would definitely order another of these products, and would absolutely buy from Christmas Lights Etc. again. Easy to set up except for getting the lights in the right order, that took about an hour.